Mackenzie Hale, a National Security Language Initiative for Youth (NSLI-Y) scholar from Centennial, Colorado, has been named October’s American Abroad Student of the Month. Mackenzie has shown exceptional leadership skills and cooperation in her first two months of the NSLI-Y program. When school began, Mackenzie was apprehensive about jumping into Chinese-only classes, but she embraced her experience and has taken advantage of resources such as her tutors and classmates. She goes above and beyond to immerse herself in university life by reaching out to classmates and joining school activities, including the dance club. In her free time, she enjoys exploring the city of Kaohsiung in Taiwan with her host family and other NSLI-Y participants. She has even helped her friends learn to navigate the transportation systems, and she always encourages others to try new experiences. On weekends, Mackenzie spends time cooking with her host family and practicing her conversation skills. On numerous volunteer occasions, Mackenzie has integrated herself with her community and her Taiwanese peers. Recently, Mackenzie visited an elementary school class along with some of her NSLI-Y colleagues and brought treats from her home. 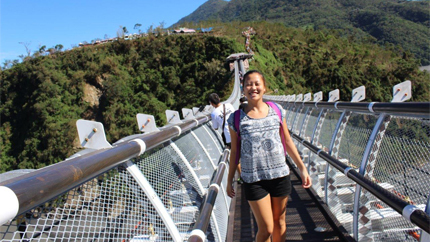 Throughout her program, she has exhibited a thoughtful and enthusiastic attitude toward her study abroad experience, and it is clear that she intends to make the most of her time in Taiwan. We are looking forward to seeing her growth as she moves forward in the NSLI-Y program.